Voted the Jacobs Blocking Trophy winner as the top offensive lineman in the Atlantic Coast Conference for a second consecutive season…named First Team All-American by Walter Camp and First Team All-ACC by the media and coaches…the leader of the offensive line, has made 31 consecutive starts since first appearing in the starting lineup against Miami in 2014…two-time ACC Offensive Lineman of the Week after games against USF and Syracuse…against USF, running back Dalvin Cook had 267 rushing yards (second-most in FSU history) while the team had 478 yards on the ground, also No. 2 in FSU history and most since 1981…against Syracuse, Cook had the fourth 200-yard rushing game of his career, going for 225 yards and a school-record-tying four rushing touchdowns en route to becoming FSU’s all-time leading rusher…the Seminoles averaged 206.8 yards rushing per game and 267.6 yards passing, most coming from quarterback Deondre Francois, the ACC Rookie and Offensive Rookie of the Year and the only freshman quarterback nationally with 3,000 passing yards…against Florida in the season finale, FSU allowed zero sacks for the first time since the 2014 ACC Championship Game against Georgia Tech. Started every game at left tackle in 2015; one of just two offensive linemen to start every game (Wilson Bell)…recipient of the 2015 ACC Jacobs Blocking Trophy – awarded to the league’s best blocker…named to watch lists for the Outland Trophy and Rotary Lombardi Award…garnered All-ACC first team honors from both the media and the coaches…claimed second team and honorable mention All-America honors…posted the highest grade in five games including an impressive 89 percent vs. Texas State and 87 percent vs. Miami…earned ACC Offensive Lineman of the Week on Sept. 14 after Dalvin Cook rushed for a career-high 266 yards and three touchdowns in a 34-14 victory over USF…helped pave the way on the offensive line for Cook’s record setting, single-season performance for rushing yards (1,691) and all-purpose yards (1,935)…Seminoles finished the year averaging 31.7 points per game (4th in the ACC) and 424.0 yards per game (4th in the ACC)…leader on an offensive line that produced nine 100-yard rushers on the year (8 by Cook, 1 by Jacques Patrick)…key protector of FSU’s quarterbacks that ranked fourth in the ACC in pass offense (255.8 yards/game) and third in pass efficiency (142.7) and completion percentage (63.0)…part of an offensive line that ranked 17th nationally, third in the ACC, in yards per carry (5.25) and 18th nationally, third in the ACC, in red zone conversion rate (89.13)…also part of the front line that paced Cook to 1,031 yards and 11 touchdowns against seven teams that ranked in the top 50 nationally in rushing defense…tied for the longest consecutive start streak on the offensive side of the ball at 18 games with Jesus ‘Bobo’ Wilson…his 18 career starts sit as the second-most by a Seminole on offense. 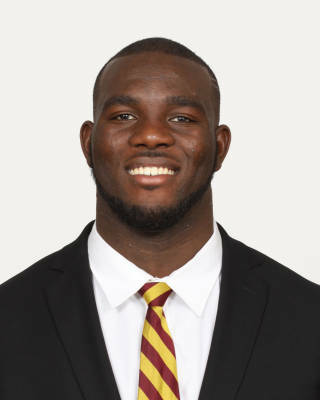 ACCOLADES – USA Today Freshman All-America Team…Athlon Sports All-Freshman Team…College Football News All-Freshman Second Team…Campus Insiders All-Freshman Second Team…True freshman left tackle who started the final five games of the 2014 season and was a dominant presence on the Seminoles’ offensive line…appeared in eight overall contests and graded out to an average of 82.2 in his five starts – on par with FSU All-American offensive linemen Cameron Erving and Tre’ Jackson…captured Freshman All-America honors from USA Today, Athlon Sports, College Football News and Campus Insiders…the Seminoles had two of their highest total offensive outputs in the ACC Championship Game (488) and the Rose Bowl (528) – both started by Johnson…helped pave the way for Dalvin Cook to rush for over 100 yards in final three games and protected the blindside of Jameis Winston, who had three 300-yard passing games in his starts. Consensus four-star recruit and the No. 1 prospect in Missouri and No. 7 offensive tackle by Scout (No. 86 overall) in the 2014 recruiting class…ranked No. 12 offensive tackle and No. 2 player in Missouri by 247Sports (No. 123 overall), No. 14 offensive tackle and No. 3 player in Missouri by ESPN (No. 158 overall)…No. 21 offensive tackle and No. 3 player in Missouri by Rivals (No. 220 overall)…ranked No. 1 in St. Louis Post-Dispatch Super 30…captured Missouri Class 6A All-State First Team honors…two-time First Team All-Metro selection…helped lead Hazelwood Central to a 12-1 record and the Suburban North Conference championship as a senior and advanced to the Missouri 6A state semifinals…the Hawks racked up 5,186 total yards of offense in 2013 (3,088 rushing, 2,098 passing)… STL Football U Junior National Elite award winner…participated in track and field in high school…chose FSU over offers from Ohio State and Alabama…born November 28, 1995…majoring in social science.